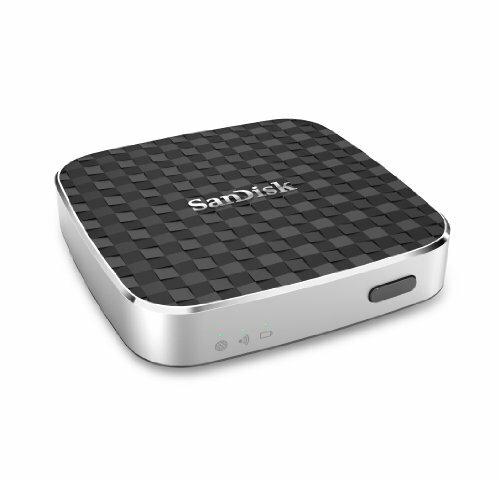 The SanDisk Connect Wireless Media Drive provides an easy way to wirelessly store and stream your favorite high-definition movies, videos, and music on up to 8 tablet and smartphone connections–including 5 different HD movies simultaneously. This pocket-sized device is designed for convenience and portability, allowing you to enjoy the freedom without Internet connections, cables, or connectors; plus, up to 8 continuous streaming hours on a single charge. The Wireless Media Drive is the perfect companion for road warriors or parents who need to keep their kids' movies and videos ready to go. The added SDHC /SDXC slot allows you to store or share more of your content or high-quality photos for instant viewing from your camera's memory card. 1GB=1,000,000,000 bytes. Actual user storage less. Based on streaming 720p content at 2mbps to one device; actual life and performance may vary depending upon usage and settings; battery not replaceable. HD (1280x720) video support may vary based on host device, file attributes and other factors. SD Card sold separately. See system requirements.